Originally I intended to make brownies that were covered in gooey caramel, that when cut would ooze with golden threads of sticky goodness. However, when I searched for a good recipe, they all called for store bought caramel which I really dislike, so I decided to make my own. How hard could it be? I don't know if it was my stove, the barometic pressure, or the phase of the moon, but I made 3 different caramel recipes and none of them came out right. First I tried to make homemade, duche le leche in my oven (boiling a can scared me!) but it just curdled and didn't resemble caramel at all. Then I tried a caramel recipe out of an old cookbook. This recipe actually looked like caramel, but unfortunately tasted bitter and burnt. This led to another cookbook recipe that I should have known from the start wasn't what I wanted, but I tried it anyway. Let's just say it involved flour - yeah, gross. So finally I just went back to what I know and made the recipe that follows. Now granted the texture of the caramel was not what I originally intended, but the combination of penuche and fudge brownies was just devine. Prepare a 13- by 9-inch baking pan with parchment paper or tin foil so that the sides and bottom are covered. Spray with Pam or butter the surface of the paper/foil. This will make it super easy to remove the brownies later. 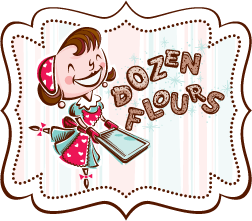 If you don't have parchment paper or tin foil, just thoroughly butter and flour the pan, paying extra attention to the corners. In a metal bowl set over a pan of barely simmering water, melt the bittersweet chocolate and the unsweetened chocolate with the butter, stirring until the mixture is smooth. Remove the bowl from the heat and let the mixture cool for 5 minutes. Stir in sugar and vanilla. Crack the eggs into a separate bowl and whisk with a fork, scrambled egg style. Pour the egg mixture into the bowl, a little at at time, stirring well after each addition. Stir in the salt and the flour, stirring until the mixture is just combined. Add the chocolate chips. Pour the batter into the pan, smooth out the top, and bake the mixture in the middle of a preheated 350F oven for 25 minutes, or until a tester comes out with crumbs adhering to it. Remove from the oven and wait 5 minutes for it cool slightly. Remove the brownies from the pan using the paper or foil and place on a large cutting board or larger cookie sheet. In a small saucepan over medium heat, melt the butter. When it's fully melted, add the brown sugar and continue to mix constantly. When the mixture is well combined, add the milk and continuing stir. Increase the heat to medium-high, all the while, stirring the caramel. Let the mixture come to boil for 3 minutes. Hover the saucepan a bit high over the brownies so that you get a long ribbon of caramel flowing from the pan. Slowly pour the mixture over the brownies in a zig-zag fashion, working from one side to the other, being sure not to cover the entire surface of the brownies with the caramel (you want to see some of the chocolate brownies peeking through the surface). Let the brownies and penuche cool completely before cutting. These look absolutely amazing! 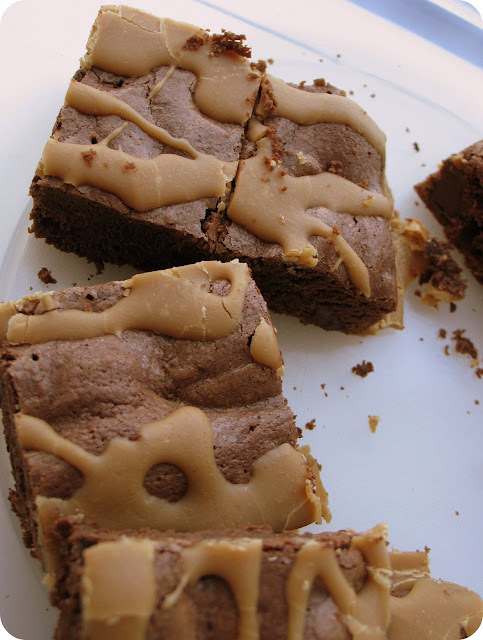 I always loved my grandmother's penuche frosting so I can guarantee I would love these brownies! those looks amazing! the caramel looks perfect...i know what's like to want to throw your baked goods out! Okay, so these things look completely deadly and don't I wish I had one right now instead of my raisin bran. I made dulce de leche by boiling a can, too, and remember being worried about it. Credit to you for so many different attempts. dhanggit - yay! Penuche is a lot more popular than I've ever thought. Although I grew up in the south, I never heard of it until recently. I wonder if I had it but it was just called something different. priscilla - thanks P! I'm glad you can empathize. I guess we just have really high standards! kellypea - hmmm raisin bran.. yumm! My coworker had two while he was eating his cinnamon oatmeal! When you made dulce de leche how long did you boil the can? I have the hardest time making homemade caramel. I think I'm cursed. 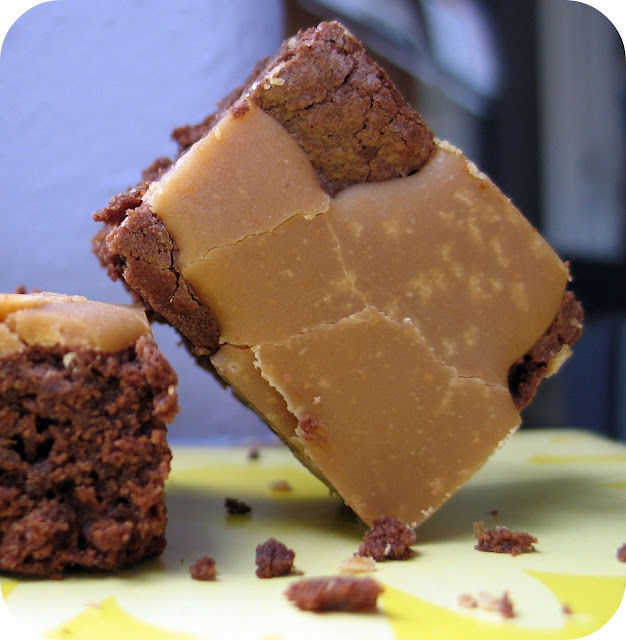 But as much as I love caramel, the penuche topped brownies sound delcious! Found you on foodgawker - oh my God these look amazing! these look abso-freakin-lutely amazing. never heard of penuche but now i'm intrigued.